U.S. and world banknotes exhibiting exceptional eye appeal will begin to receive a Star (★) designation, Paper Money Guaranty (PMG) announced Monday, June 9, 2014. 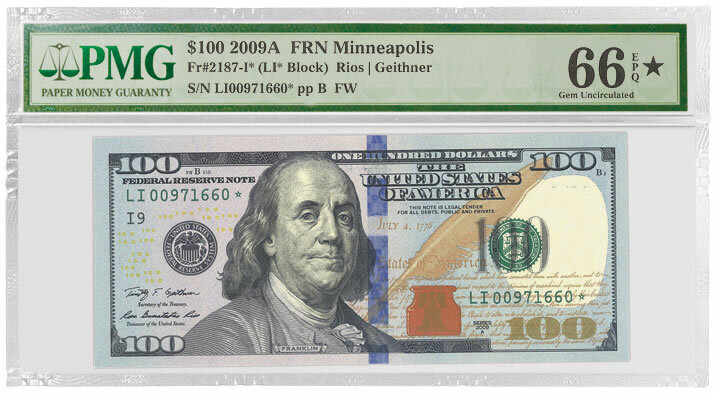 PMG, a third-party paper money grading and encapsulation service, will start using the designation at the Memphis International Paper Money show held June 12 to 15. "There has been growing demand among collectors and dealers for PMG to impartially evaluate eye appeal and designate notes that are superior in that regard," says Bruce Thornton, PMG Finalizer. "After careful study, we have established criteria that we believe will make the PMG Star Designation the industry standard for exceptional eye appeal." To submit PMG-certified notes for reconsideration for the Star Designation, write "Designation Review" at the top of the PMG Submission Form. The Star (★) Designation was introduced in 2000 by Numismatic Guaranty Corporation, an affiliate of PMG, to recognize superior eye appeal on coins. Oh, be still, my heart! Something already graded, for an exorbitant fee, now is eligible to re-graded, for an additional fee, to see if the Treasury mixed the ink, correctly, used more than the normal pressure to emboss the design and if the “grader” can actually “see” it. What a scam! What’s next? MS-70 DCAM upgraded to MS-70 DCAM Wow-1-10? Oh, don’t forget the extra fee! By the way, I’ve never seen a note, above 66FPQ. Even the notes which come from the Mint as a companion to a coin, specially printed, which should be the finest ever made, I’ve only seen 66MPQ. I think I’ll pass. I will pass as well.. A big G-I-M-M-I-C…. Is Gem 66 the best grade you can get ?I already have the Exact one pictured with the exact same Grade !!! Not worth the extra $15.00 just for the Star!! I would offer you $100 for it if you pay the shipping.